Selling Pizza Kits can be the most profitable fundraiser available. It is not uncommon for people to search for pizza coupons online or in newspapers as the price of ordering a pizza has risen dramatically over the years. Why not offer them a Pizza Kit to have on hand at home. For $18 a kit (around the cost of having a pizza delivered from a local pizzeria,) each buyer will get the ingredients to make THREE of their own! 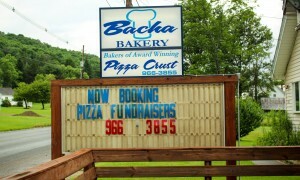 Here at Bacha Bakery, we aim to establish a loyal customer base by providing a quality product at a reasonable value. We truly believe that after this fundraiser is over, customers will be asking when your next one will be! No matter the number of pizza kits you sell, your group will profit $5.00 from every kit sold. We also include a sales incentive to your sales team, a free Pizza party package after 100 pizza kits sold! This would include: 6 – ½ tray pizza crust, 3 quarts of Pizza sauce, and 6 – cheese packages. Your group will receive pre-printed order forms, with your approved selling dates and your delivery date. Your pizza kits will be available for pick up at a pre-determined time. We can make arrangement to deliver your order or set a time for pick-up at our bakery. A Pizza Fundraising Kit flyer and order form sample included with this letter.